I know, I can't believe 2018 is mere hours from being over either. Exactly how this year flew by so quickly is beyond me, but alas, here we are, and it wouldn't be the end of another year without a rewind that pays homage to the people who made this year one of the most stylish yet. So why don't we take a little walk through the fashion blogger museum, shall we? While there were tons of new bloggers who popped up on our radars, the following eight really stood out for more than one reason. These are the fashion girls who cut through all the noise and shared their undeniably original style with the world all year long. Whether they were uncovering the coolest affordable finds, getting creative with their Instagram aesthetic and styling techniques, or all of the above, they definitely held our attention. Considering just how many bloggers there are in the game these days, we don't say it lightly when we name each of them as the best fashion bloggers of the year. So without further adieu, we present to you Who What Wear's best dressed blogger list of 2018. Christie's take on minimalist NYC style really caught on. In a year when trends were loud and out-there, Tyler's warm-toned outfit photos and choice interior shots felt like a breath of fresh air. Who What Wear athleisure columnist Anaa Saber knows a thing or two about wearing sneakers. Her closet is always stocked with pairs from the buzziest drops, and she's garnered quite a following for her "unorthodox sneaker styling," which the below outfit exemplifies. Sabina is a favorite at the Who What Wear offices for her fresh take on classic French-girl style. While her style definitely fits with the trope of the effortlessly romantic Parisian, she mixes in trendier pieces here and there. 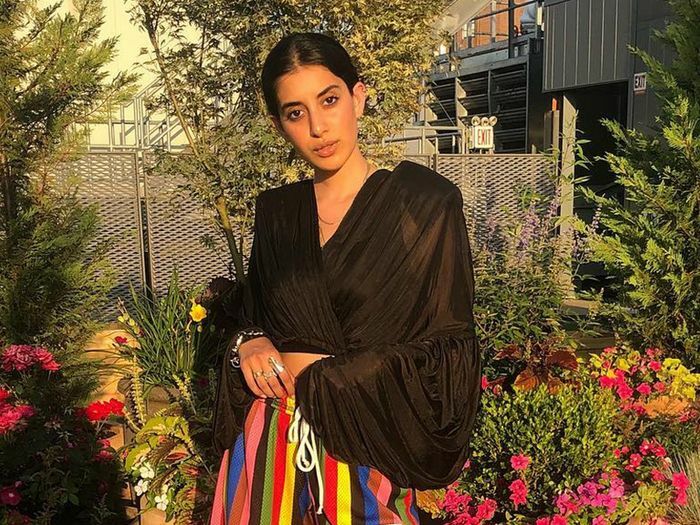 Expert vintage shopper and master at wearing color María Bernad was at the top of our minds and Instagram feeds this year thanks to many her out-of-the-box styling ideas. A staple on the NYC fashion scene, we turn to Karen to get inspired by how to wear the season's key trends like a tried-and-true New Yorker. Noor's editorial-feeling images and penchant for dramatic shapes made her feed really stand out this year. Whether she's wearing jeans and tee or a dress and heels, her outfits are always polished beyond belief. We get the idea that Nicolette's bright feed is simply a visual extension of her personality. She loves a good print and a pop of color, making each outfit she wears a fun one. What can we say? We get a good deal of inspiration from our Parisian friends across the Atlantic, and AnneLaure is partly to blame for this. Her simplistic yet stylish outfits are exactly the kind we want to copy immediately. Next, see the best-dressed celebs of 2018.